Operation Gateway - the operation launched after an ultimatum to investors and overstayers to sort all the required paperwork with the Department of Immigration (DOI) and Department of Labour (DOL) has raked in over Vt3 million(US$281,000) into Vanuatu Government coffers. But the Gateway Operation Team is facing another threat – interference from politicians. “I want to ask all Members of Parliament to stay out of the operation,” said Minister of Internal Affairs, Andrew Napuat. “Do not assist or put pressure on the officers in the departments engaged in the operation to grant visas when the foreigners do not meet visa requirements or work permits. “I ask all politicians to stay out of this. Whoever is trying to assist foreigners bypass this process, know that this ministry will not tolerate it. The laws are there, all concerned should just follow the law, comply with the requirements and submit their applications. “Anyone caught trying to assist foreigners bypass our laws and get involve in corruption will be dealt with. During the initial announcement of the operation in February, records from the Ministry of Internal Affairs put the number of overstayers in the country at 600. “They were given three weeks to come forward and sort their papers, and some of them have done this, Minister Napuat told Daily Post. “Operation Gateway was launched on the 19th of March. So far, the fines and penalties paid by over 200 individuals to Labour and Immigration just last week has totaled up to Vt3 million. A 28-man team from the DOI, DOL, Vanuatu Investment Promotion Authority, Foreign Affairs, Customs and Police kick started the Gateway Operation in Port Vila. Minister Napuat said the Vanuatu National Provident Fund is also working with the team, to ensure the Minimum Wage aspect is being enforced. The operation clamps down on overstayers and people who breached visa requirements. For example, coming to Vanuatu on a tourist visa but currently working and those who come in as investors, set up businesses for a short while and then move to work for other people without notifying the authorities. Minister Napuat says the operation will run for three to four weeks. “A18-man team is in Santo this week,” he said. 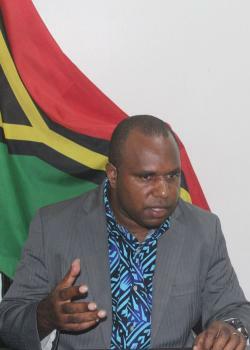 The minister also mentioned the possibility of extending the operation in Port Vila.